As mobile ordering heats up to become an increasingly important strategy for reaching digitally-savvy customers - and particularly smartphone-equipped millennials - these new investments give a clear indication that Domino's is looking to be a leader in this space. While Domino's has previously been able to deliver pizza to unusual destinations, the company has decided to streamline the process by establishing 150,000 designated Domino's Hotspots at parks, beaches, sports fields, and thousands of other locations across the US that don't have a traditional address. The new Domino's Hotspots - launched in April - are designed to create flexible delivery options for customers, and eliminate the need for complicated directions to be given when placing an order to a non-residential location. Using their smartphones' location services, customers can find out where their nearest Domino's Hotspot is. Heading to the Domino's website or firing up the Domino's app will then connect them with the nearest Domino's pizzeria, where they can place and pre-pay for their order as normal. Customers are then encouraged to leave a note describing their physical appearance - "Guy with a beard in the green t-shirt", for example - to help delivery staff identify them upon arrival, as well as a mobile number should there be any issues. While waiting for their order, Domino's sends customers updates - including estimated delivery times - via text so they can keep track of its progress. "Now customers spending time at some of our new Domino's Hotspots locations, like Tommy Lasorda Field of Dreams in Los Angeles or even next to the James Brown statue in Augusta, Georgia, can have a pizza conveniently delivered to them, thanks to our innovative Domino's Delivery Hotspots," said President of Domino's USA, Russell Weiner. Going beyond giving customers more delivery options when ordering their favorite pizza, Domino's has also introduced something fun for them to do while they wait for it to arrive - and earn rewards at the same time. Piece of the Pie Pursuit is a new mobile game from Domino's that challenges customers to beat six levels of puzzles and obstacle courses designed to test their mind and dexterity. Based around a Rube Goldberg machine, levels include guiding a pizza cutter-shaped car along a crazy track against the clock, using catapults to fling pizza sauce to ever greater heights, and other physics-based challenges. If players can beat all six levels, they are rewarded with a one-time prize of ten points towards their Domino's Piece of the Pie Rewards scheme - a sixth of the way to a free pizza, and equivalent to the reward received for placing a food order valued at $10 or greater. Not bad for simply playing a video game. Piece of the Pie Pursuit - available on both Android and iOS devices - also features time trials and leader boards to encourage repeat usage after players have beaten it for the first time. "This is the ultimate game for pizza fanatics," said Domino's Director of Loyalty Marketing, Steve Kennedy. "Not only does it have six types of unique gameplay to keep you coming back for more, but it also gives Piece of the Pie Rewards members a chance to earn real-world bonus points toward free pizza." 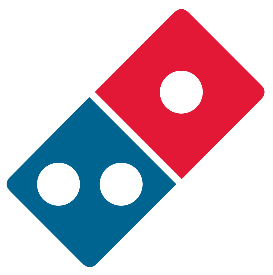 Domino's Hotspots and the superbly innovative Piece of the Pie Pursuit game are both very clever ways for Domino's to leverage mobile technology to improve convenience and offer fresh new experiences to customers. The introduction of Hotspots is of particular note for its complete reliance on mobile and online ordering. Getting take-out food delivered to an outdoor location has always been a challenge - both for the customer and the outlet they're ordering from. Trying to describe the meetup spot to a dispatcher who must then relay the directions to a delivery person often leads to confusion, a lot of wasted time, and disappointed, hungry customers. Establishing set drop-off points is a simple yet elegant solution, and a smart way to remove the frustrations inherent with outdoor deliveries. "We listened to customers and their need for pizza delivery to locations without a traditional address," said Steve Kennedy. "We know that delivery is all about convenience, and Domino's Hotspots are an innovation that is all about flexible delivery options for customers." You can hear Domino's Director of eCommerce, Jason McCann, speak at Mobile Next 2018 this September at the Omni Rancho Las Palmas, Rancho Mirage, CA.